SECRETSUNDAZE STUDIOS is the latest project from secretsundaze founders Giles Smith and James Priestley. Launching in the year of their 15th anniversary, the studio is based in the heart of the Secretsundaze HQ at The Laundry in London Fields. Home to their artistic community, Secretsundaze Studios is the perfect space to create, record and collaborate. The studio has grown organically through the shared vision of founders James and Giles and the duo’s in-house engineers, artists & friends George Levings (Endian, Commix), Tony Nwachukwu (CDR, Attica Blues) and Sam Jones (Soundthread). 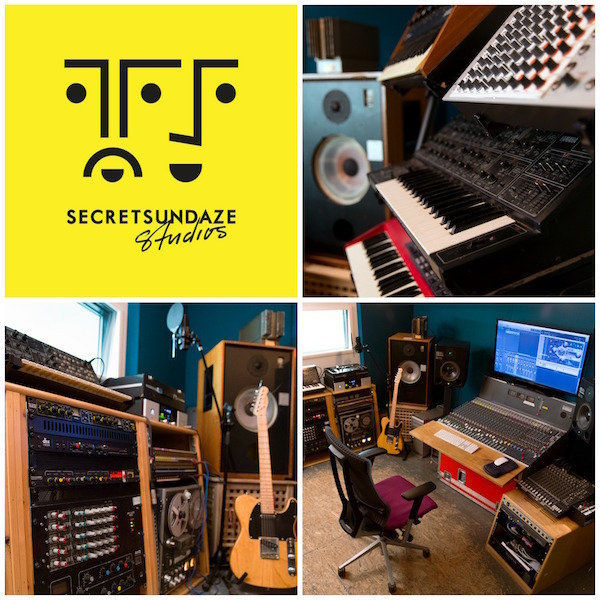 Secretsundaze studios provides a comprehensive production, recording and mixdown facility, making it the ideal environment in which to make your music stand out. Studer preamps in the desk, and different valve stages from outboard equipment help give that analog edge to a digital project, using Apogee converters to capture and represent that presence and warmth in the mix. Adding to your creative juices, there is a Fender Rhodes and Akai valve tape machine, plus a selection of synths old and new, with the whole set-up running through stunning Rogers BBC design LS5/8 and Meyer Sound HD1 monitors. The Laundry building is a multi-use workspace with a restaurant, 24 hour concierge and roof terrace hosting exciting music, arts, fashion and film individuals and organisations. The air-conditioned studio is available with flexible working hours, at affordable rates, across daytime, evening and nighttime sessions, 7 days a week, with a sound engineer available upon request. There are also options for longer-term lets and the studio is available for mixing and mastering sessions engineered by one of the in-house artists. The studio will be regularly hosting guest artists ‘in session’ and will also run a selection of music production courses, from beginner to the more advanced, with other classes focused on producing with analog gear and mixing techniques, all taught by experienced producer tutors. Secretsundaze studios will also be teaming up with CDR for a new project, ‘Out The Box’. Every month, they’ll be inviting budding young producers to an evening session at Secretsundaze HQ to hear their tracks in our professional studio environment and to receive feedback from Tony Nwachukwu and other key members of the CDR community. The team are excited to be able to give future crops of producers the opportunity to escape the confines of a laptop screen and provide insight into the worlds of hardware production and studio conditioning.